Hey ya’ll! Welcome to my stop on the Crewel Blog Tour! I have an interview today between author, Gennifer Albin and her editor, Janine from Farrar Straus & Giroux! I also have a finished copy of Crewel to giveaway and a Crewel bracelet! Don’t know what Crewel is? Check it out! And make sure to check out my review! Free Chapter sampler from Barnes & Noble or you can read it on Facebook! To Janine: When did you know you were going to buy Crewel? I knew from reading the very first sentence that CREWEL was a project that I had to have! I read the manuscript one summer afternoon while pretending to play with my son in the sandbox and pool (good thing my husband was there to actually take care of the poor child! ), and fell in love with it. How many people read it in-house before you offered? A handful of people in marketing and sales and FSG's publisher, Simon Boughton. Everyone agreed that it was the perfect project for FSG's list: it is just the right blend of literary and commercial, and it's artfully written. To Genn: When did you know you were going to choose FSG/Janine? It was a hard decision, because it felt so important. It was my debut book, after all! It was really down to two houses, and Janine understood I wanted this story to be a trilogy. The other editor thought two might do. Believe me, I couldn't squash this story into two books! Then we (my agent and I) received an email the day before auction closed with an amazing plan for the book, and that pretty much clinched it. I slept on it, woke up the next morning and called my agent to accept the FSG deal. What's your editorial process like? It involves lots and lots of reading and re-reading, and asking questions, as well as more detailed line edits. It's especially important when world-building is involved. What she said! I tend to layer in as I revise, so rereading is crucial. Plus, I get a little wild with my worldbuilding and plots, so we have to make sure they make sense. What are you most excited about in coming books in the Crewel World trilogy? Watching Adelice hone her skills and become who she destined to be. Writing kissing scenes. What? It’s true. Which boy would be your fictional crush in the book? Hmm. They're all too young for me! But the sixteen-year-old me would definitely have crushed on Erik because he's a little bit dangerous. That’s hard to say, especially since I know who she ends up with. I plead the fifth. To Janine: Was it the world or one of the characters that hooked you? Both! I love the world Genn has created. It's so rich and unique, and it feels completely real. Genn has a gift at crafting characters that come alive on the page, and you find yourself emotionally invested in their lives. Plus, she is a master at giving the reader villains that you will love to hate. Adelice, of course! She's tough and determined and I like that in a girl. Beyond that, I totally enjoyed when Maela showed up in scenes. She is pure evil in a good way. I won’t lie. I love Cormac. I can’t even say I love to hate him. He just flows onto the page. YES! Genn is an editor's dream author. She's fun and smart, and she views the process as a collaboration, which it should be. I have to finish this series first! But I love Janine and FSG, and I think there’s a lot of value to building a relationship with a publishing houses rather than jumping around too much. 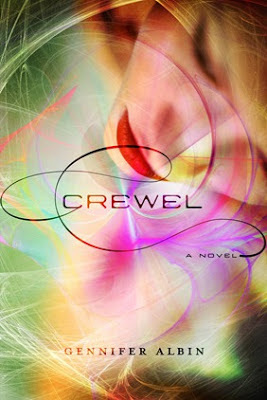 Check out the rest of the blog tour stops for more chances to win Crewel! If I knew that the fabric of time was literally in the palm of my hands..I would freak out. Haha! I'm no Time Lord so that would drive me mental. I'm not really comfortable being the pivotal point in any situation. Been wanting to read this one, love the cover! I would leave time alone! Too much could be really changed and destroyed (or really mixed up) if anyone put their finger(s) in it, with possibly disasterous results! Well, I'd definitely *try* to make the world a better place (and maybe go back to 1990 and buy LOTS of stock in ebay hehe). Love this post!! Loved this book!! I can't wait for the next one and I am glad that she went with FSG and is able to make this a trilogy! I would try to prevent as many tragedies as possible...and make some great investments! I would give myself more time to study for exams, any more than that and I'd probably end up causing some horrible space time explosion. I would probably freak out. Then experiment with my abilities. If I had the responsibility of weaving time with my hands, I would be thoroughly stressed out and nervous about making a huge mistake. However, I would try my best to make the world a better place, and make the best decisions that I could possible make. If I controlled the fabric of time, I would likely stress out until I went insane. I hope I would make the world a better place, by helping scientists eradicate malaria, healing the stupid bipartisan rift, spreading democracy, etc, but I fear I might spend far to much time being petty and tormenting the evil preppy girls. If I could weave time, I wouldn't want to start off doing something too dramatic. Maybe try to make it so that I meet the Queen! Honestly, I'd love to meet my fave people a lot. But also use the ability for others. I'm not sure. I think I would implode due to the stress of the situation. However, I think I would try to make the best decisions for everyone. I wouldn't be pretentious, but first off, I'll be selfish. Man is indeed selfish. I would gratuitously develop and integrate myself and the rest follows. I would be overwhelmed by having to take responsiblity for every bad thing that happens to good people! A better question would be what wouldn't I do. Nothing evil, but boy, there would be some changes on this planet! I would go back to that one moment in time just to change the outcome of my future. It's selfish but I'd probably go back and do-over some things. I would probably...experiment like crazy with it. I'd be too scared to actually do stuff, lol. I'd love to go back and right some wrongs. Like some wars, they never should have happened. I *might* go back a ways to hit the Powerball lol. What a cool concept!!! I would be tempted for some do-overs even though I know it would probably mess everything up more than my original choices. Hmm, I can think of plenty of things I'd want to change in my own life, but I'd be afraid then I wouldn't be who I am now, so I think I'd leave time alone. I don't think I would know what to do in that situation! I guess just try to mess things up as little as possible! I would be super stressed out...I mean, who knows what all could change from just me altering one thing? That is a heck of a lot of responsibility.